Handley Dirt Work Plus - Eastern Iowa. Handley Dirt Work Plus, LLC is an insured family owned and operated business. 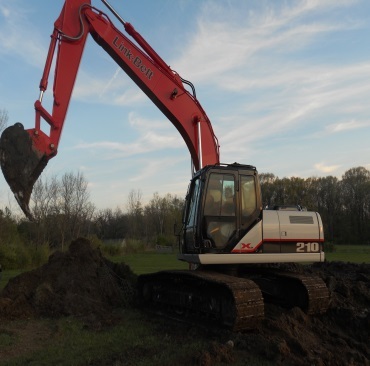 We have many years experience with different types of projects ranging from digging water lines and ponds to building demolition. We take pride in our work whether it is a small project or a large one. We will strive to meet your needs. You can count on us to do timely, efficient work. We maintain clean, safe job sites and do a professional job. We provide a large variety of excavating services. From small waterline jobs to 1 acre ponds. You can expect professional, efficient, safe and clean job sites. We will go over the job with you in every step to make sure we are meeting your expectations. Our snow removal services consist of commercial and residential snow removal using the latest equipment. We can also include sidewalks and custom salt and sand. Call for pricing and book early. We install all types of drainage systems. Drain tile, yard grading, French drains, catch basin, downspout drainage and sump pump drainage. We will do drain tile from down spouts on your house up to large field drainage solutions. Let us help clear your land for agricultural, recreational, site clearing, or personal purposes. Whether it is a fence line, timber clearing, walking / ATV path, hunting ground, or clearing a site for your new home or building. We clean up all clearing sites by running a root rake over the ground. Please call and ask us how we can improve your property and raise the value of your land. We offer dump trucking and equipment hauling services. We haul all quarry materials, dirt, boulders, broken up concrete and snow. We work with equipment dealers in the area to haul their equipment to other contractors or other stores. With our demolition services we strive on job site efficiency, cleanliness and safety. Those are the three most important things to have when tearing down any sort of building or silo. From start to finish we make sure that we have the right tool for the job and with our trained staff it will be done right the first time. With growing up on a farm I understand the importance of productivity of crop yields, erosion prevention and how to improve the quality of your land for your investment. We time management our work load for spring and fall because we understand the short windows farming has to complete work in the fields. We provide all of our service to the farming community. We work a lot with farmers whether it is shaping water ways or clearing timber and making the ground tillable. We also do a lot of water lines and frost free farm hydrants. Whether it is a down spout on your house that needs tiled out in the yard or you need your entire yard tiled we are the guys to do it. We will go over every step with you so you understand how the water was flowing and how we are changing it. We also go to a larger size scale and repair and install field drain tile.